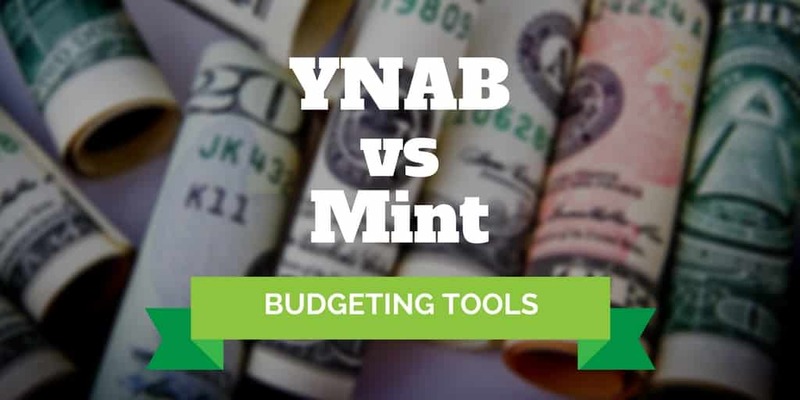 Home › Budgeting Tools › YNAB vs Mint: Which Is The Best Budgeting App? YNAB vs Mint: Which Is The Best Budgeting App? If you find it a hassle to keep track of your personal finances, Mint and YNAB (You Need A Budget) are personal finance apps that can help you budget smarter and get a better handle on your income and spending habits. You can think of YNAB as a personal finance app that specializes in budgeting whereas Mint has a broader suite of tools that include budgeting, bill payments, tax reporting, and investment tracking. Both applications are accessible via the web and on mobile devices, but YNAB will set you back a small monthly fee whereas Mint is 100% free. But when you compare Mint vs YNAB across all the dimensions of tax reporting, credit score monitoring, and transaction reconciliation which is best? Mint Vs YNAB: Which Is Right For You? Mint and YNAB both synchronize with your financial institutions so your income and spending are tracked and easily accessible on each of the platforms. You can view all your accounts in one place so it is easy to stay on top of your finances. And it is intuitive to navigate around each of the dashboards, link to your credit card and bank accounts, as well as any loans you may have so you can stay on top of your liabilities too. Plus, both budgeting apps do an excellent job when it comes to goal tracking so you can set, track, and target your financial goals. YNAB is like a budgeting tool that stretches a mile deep while Mint is a personal finance tool that incorporates budgeting but is a mile wide featuring other financial tools too. Where Mint shines is not only in providing a budgeting tool but also in offering a host of peripheral services from tax reporting to bill payments and from investment tracking to credit score monitoring. So should you choose the specialist budgeting tool, YNAB, or Mint, the budgeting app with extra trappings? While Mint and YNAB both do an excellent job when it comes to budgeting, they differ in many other ways. If you are price-sensitive, Mint is your best bet. It’s not that YNAB is particularly expensive. In fact, it is priced similarly to a Netflix subscription but you still pay a $6.99 monthly fee compared to Mint which is 100% free. YNAB does offer a 34-day free trial so you can check it out 100% risk-free. But if Mint is free and YNAB costs you a monthly fee, you might be wondering how does Mint makes money? Unlike YNAB, Mint will serve you advertising offers. But before you shudder at the thought of yet another financial offer hitting your email inbox, it is worth understanding how Mint can actually save you money with these offers. Mint is smart enough to know when other products and services can possibly save you money. Mint has a Ways to Save section which features financial service providers who pay Mint a referral commission when you sign up. These offers can be quite useful. For example, you may be paying a high interest rate on a credit card and discover a credit card offer which enables you to transfer your balance at no cost and pay no interest for a period of time. You also have the option to pay Mint for premium access to your credit report. And Mint also makes money from the display ads featured on its site. Lastly, Mint sells aggregate consumer data that provides insight into spending, bank fees, and saving habits. You don’t have to worry that your individual data is being sold. Mint bundles users into cohorts and sells collective data so your privacy is maintained. Mint has the edge over YNAB when it comes to tracking your 401(k), IRA, or other retirement and taxable accounts. Whereas Mint will give you insights into your account balances and holdings, YNAB does not feature any investment tracking. Instead, it sticks with its bread and butter focus on budgeting. Although Mint fares well compared to YNAB in terms of investment tracking, Personal Capital is best for serious investors. Unlike Mint, YNAB makes it possible to reconcile transactions. The idea is that the transactions listed in your YNAB account match the transactions that your bank has in its records. Transactions are considered to be “cleared” when the transaction recorded in YNAB appears in your bank’s records too. When all transactions match, your account is deemed to be reconciled. For detail-oriented users who like to comb through spending habits with a fine-tooth comb, transaction reconciliation is a valuable feature. If you tend to be more of a high level person who wants the ability to view your overall financial situation and see details of transactions but not reconcile them, Mint is more than sufficient. If you find it a hassle to log into multiple accounts each month to pay your bills, Mint has a bill payment function that you will love. Instead of logging into your Comcast account to pay your cable bill and your PG&E account to pay your electricity bill, Mint makes it easy to pay all your bills from within your Mint account. YNAB does not feature a bill payment solution so if you care about having all your bills tracked in one place and receiving notifications when bills are due then Mint is your only choice between the two personal finance apps. You can get a snapshot view of how Mint and YNAB compare below. Beyond the headline differences, Mint and YNAB also differ when it comes to credit report monitoring and security. Mint will give you access to your credit score and monitor your credit too. It also provides two-factor security authentication – neither of which YNAB provides. You can however set budget goals in each budgeting app and receive alerts. So when you exceed your budget in one category, you can be notified quickly to nudge you to reduce your spending in another category so your overall budget tracking remains on target. Mint caters to both U.S. and Canadian financial institutions whereas YNAB supports only U.S. based companies. Both have excellent user experiences. It’s easy to get started with both budgeting apps whether on mobile devices or on the web. And both support iOS and Android operating systems. Mint even goes so far as to support the iWatch. Historically, Mint has not shined as brightly when it comes to account synchronization compared to YNAB, which is stellar in this area. While Mint overshadows YNAB in a host of areas, you should think twice about it if you are bothered by ads. Mint is designed to serve you value-added financial ads that help you to save money but if you don’t like being interrupted with offers you might prefer to pay YNAB a small monthly fee to avoid them. What makes budgeting hard is not so much the predictable expenses from one month to another as much as it is the unexpected costs that crop up every once in a while. Mint and YNAB can help you to anticipate bills that can otherwise fly under the radar. For example, a car insurance bill that hits your account every six months or an annual bill that may otherwise be forgotten until the debit hits your bank account when it’s too late. Mint will also flag to you when unusual spending activity is observed in your account. You can customize your notification settings for easier management. Mint lets you know when you are charged late fees as well as when interest rate changes affect your bill payments. The idea behind the three-step process is to think about each dollar as having a specific role. Instead of all your money being pooled, you view each dollar as segregated from the next and playing a specific role in paying your bills. Another important aspect of the budgeting strategy is that you anticipate larger expenses that hit your bank balance infrequently and budget them into your monthly costs. For example, vacations and gifts may be predictable each year so it is best to incorporate them into your monthly budget plan. And if you do overspend one month in a single category then you can try to spend less in another category so your overall budget stays on track. Credit card and student debt levels in the U.S. have spiralled into the trillions of dollars, so Mint wins high marks for emphasizing debt payoff on its platform. YNAB also has a keen eye on liabilities, which for many users is a key monthly cost that limits the ability to save. YNAB and Mint are among the best personal finance apps available to users across all devices, whether web-based, iOS or Android. If you are looking to keep track of every penny and be granular about your budgeting strategy, YNAB does an excellent job helping you to keep track of your income and spending habits, and debt levels. Above all, it helps you to reconcile transactions to you match your bank account transactions with your YNAB ledger. Where YNAB goes a mile deep on budgeting, Mint goes a mile wide with helpful personal finance tools. For example, you can track and manage your bills, pay them from one account, monitor your investments and your credit score, receive free access to a single credit score, and feature tax reporting. YNAB does a better job than Mint when it comes to account synchronization whereas Mint does a better job on security by providing two-factor authentication. The bottom line is if you want a fine-tooth comb approach to budget tracking and are willing to pay a small monthly fee YNAB is your best bet. However, if budgeting without the need to reconcile transactions is sufficient, and peripheral features, such as bill pay, tax reporting, and investment tracking are valuable to you then Mint will most likely be the better choice, and as an added bonus it’s free. ‹ How Much Does A Root Canal Cost?